Of his art I can tell you more, and it is, I think, an intriguing story, tantalizing in the possible answers to the mysteries involved. The bare facts are these; Albert Carmichael’s first known published work is a strip titled Why Be Discontented? that ran just a handful of times in August 1907 in the New York Evening World. The strip was nothing memorable, and Carmichael’s art was rough. Carmichael may have been freelancing, because he continued to appear in the World on occasion but not nearly often enough to indicate that he had a steady job. Perhaps he did, though; often newspaper artists were kept busy with photo retouching, drawing maps, and the many other less glamorous art jobs that a newspaper affords. 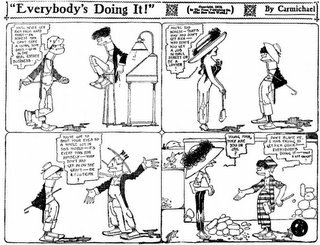 The interesting thing about Carmichael’s cartooning work at the World was that it began to look more and more like the style of George McManus. And since McManus was one of the star cartoonists at the World, that may very well mean that McManus had taken young Carmichael under his wing and was tutoring him. As time went on, Carmichael’s art becomes almost indistinguishable from McManus’. By 1910 or so something amazing was happening – Carmichael, though still closely mirroring McManus’ style, began to surpass the master. McManus’ work at this time, though excellent in its own right, was still hampered by minor stylistic flaws, occasional questionable draftsmanship, and a certain cookie-cutter approach. Meanwhile Carmichael was honing the style, making his line more fluid, his characters move better, his draftsmanship becoming impeccable. McManus’ art, meanwhile, does not likewise progress. In 1912 McManus finally responds to the siren call and wide open coffers of Hearst. Hearst, since the 1890’s, had made a habit of not nurturing talent from within his organization, but instead simply wooing away the best people from other papers. On McManus’ departure his flagship World strips The Newlyweds And Their Baby and Spareribs And Gravy are reassigned to the obvious choice – who else but Carmichael to be his successor? Carmichael takes over the strips, now a valued newspaper cartoonist of the first rank. However, he is not allowed a byline on these new strips, and rarely does his signature on them survive to be printed in the paper (but we do know he signed them from the original art that pops up from time to time). Laboring in virtual anonymity, Carmichael continues to enhance his cartooning skills, now producing a version of McManus’ style that clearly overshadows the originator. In December 1916 Carmichael’s version of The Newlyweds And Their Baby comes to an abrupt halt at the World. Whether for lack of interest or because of the rumored impending death of Carmichael I simply don’t know. In any case, Carmichael’s work for the World ends, and he does not go anywhere else that anyone has been able to find. The eerie conclusion to the story is that starting around 1918, a year after Carmichael’s presumed death, we start to see a change in McManus’ art style. It begins, ever so slowly, to take on the qualities of Carmichael’s art. Over the next half a decade or so, McManus hones his own skills in the same direction taken by his former impersonator. By 1925 or so McManus has shaken off all the rough edges and bloomed into his elegant yet superbly comedic mature style – a style that looks very much like Carmichael’s. Oops – almost forgot. 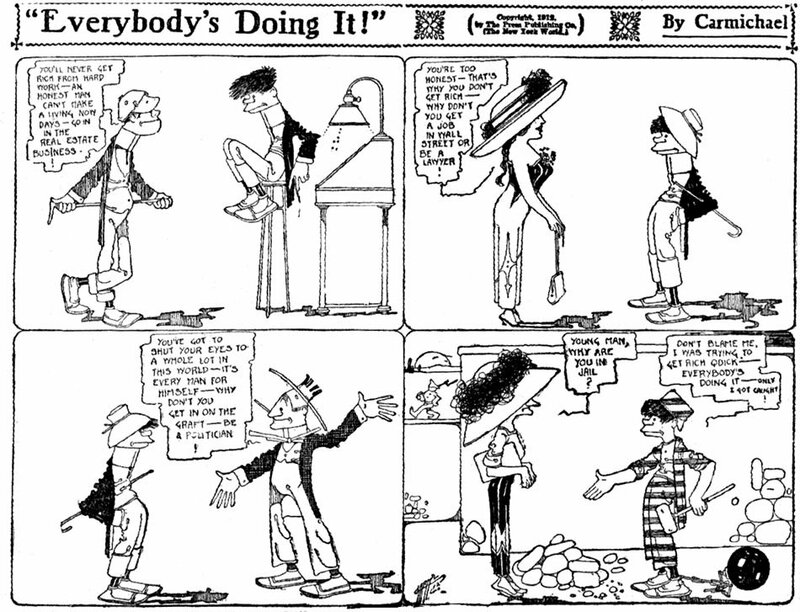 The sample strip above was published in 1912, not long before Carmichael took over McManus’ strips.